This work was created at the FRAC Lorraine in Metz, France, where I was invited to create new work as part of the exhibition Ressources Humaines curated by Virginie Jourdain. The exhibition was organized around issues of cultural labour. I began the project by speaking with the médiatrices (the employees who are present in the gallery alongside the exhibition. They accompany the exhibition, greeting the public, discussing the work with the public, if requested, and offering tours to various groups from children to specific cultural demographics). I was interested to learn about their position, the tasks they fulfilled, and the conditions under which they were employed by the FRAC and how their presence alongside the exhibition was supported and framed. 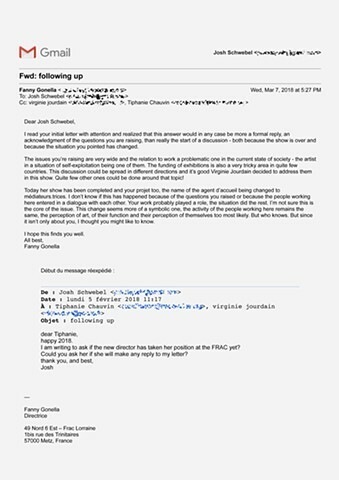 I discovered that the FRAC, like many other cultural institutions in France, employed mediators by way of a third-party corporate contract. 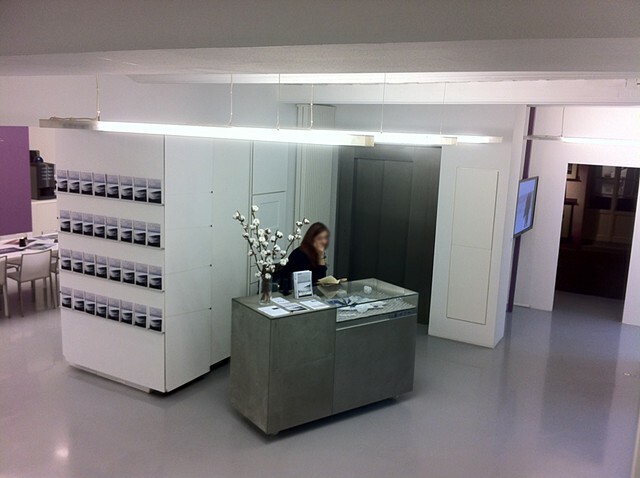 The institution externalized the position of the staff responsible for translating the exhibition to the public. After several unsuccessful forays attempting to communicate with the institutional administration, I proposed to displace the front desk and the mediators from within the gallery foyer to the courtyard outside. This displacement was intended to make the externalized status of the mediators transparent. This proposal led to unexpected internal conflict and was resisted by the exhibition coordinator, the technicians and one of the three mediators with such intensity that on the day of the opening it was decided to reverse the displacement. 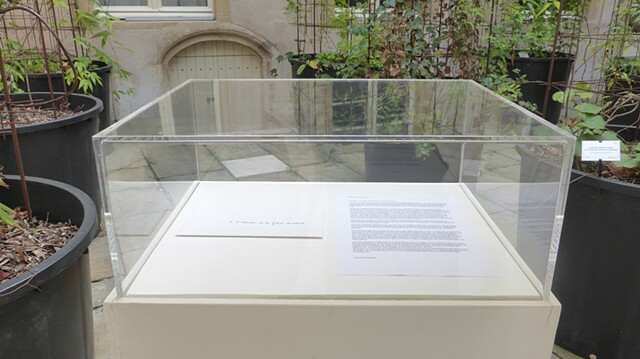 In the end, I exhibited a letter and statement in a vitrine outside the gallery, in the place where the mediators were to have been positioned. I speak about this project in greater detail in an interview with La Belle Revue.